Minimum order is 50 coolies. Pricing as low as $1.74 each. 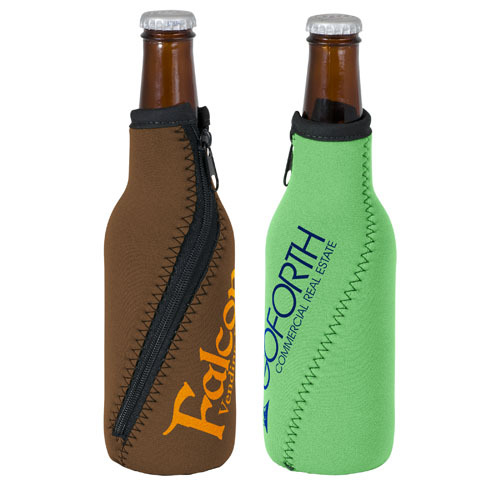 These super impressive twister zipper bottle koozies definitely have the WOW factor. Our High-Quality Neoprene (wetsuit material) is made with a durable zipper & sewn in bottom. 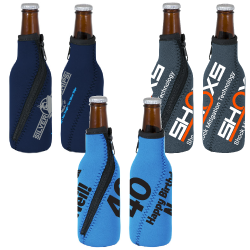 Our newest bottle koozie will allow you to pick, koozie color, imprint color, zigzag stitch color and also top trim color from an assorted color chart. With so many choices you can make these a hit, make a statement and be the first to have it!